At approximately 11:40 pm last night, Jasper Police Department received a report that a female forced her way into an apartment and started a physical altercation with the two occupants. In an attempt to prevent the female from doing any further harm, one of the occupants restrained the female until the officers arrived. One of the occupants sustained injuries during the incident. Upon further investigation, the female, Cayla Clayton of Jasper, was taken into custody. 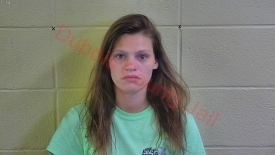 After being medically cleared at Memorial Hospital, Clayton was lodged in the Dubois County Security Center and was charged with a Level 6 Felony Count of Residential Entry, a Class A Misdemeanor Count of Battery, a Class B Misdemeanor Count of Disorderly Conduct, and a Class B Misdemeanor Count of Public Intoxication. Jasper Police Department was assisted by the Indiana State Police. Be the first to comment on "Late Night Break In Results in Arrest"